Brooke Pendley is a self-described “fire-breathing young female conservative patriot” out “to save Judge Roy Moore” with a newly formed political action committee, but good luck trying to find her beyond the fundraising emails. On Oct. 17, Pendley filed a statement of organization for Club for Conservatives PAC with the Federal Election Commission, listing herself as the treasurer. Over the course of less than three weeks, Pendley has sent out at least 10 fundraising emails. Each plea for money usually included more than 1,000 words from Pendley, railing against liberals, Democrats, the media and so-called establishment Republicans, using red-meat rhetoric that grass-roots conservatives love, along with a picture of a blonde young woman at the end with her signature. Someone with such strong opinions who is sophisticated enough to set up a PAC seems likely to have previous work in politics, grass-roots causes, or conservative media. But Brooke Pendley doesn’t have a discernible online profile anywhere except in the fundraising emails. (The only other time she shows up in a Google News search is from someone citing one of the emails.) And the basic information surrounding the PAC is confusing at best. Where is Club for Conservatives PAC? In the FEC filing, Pendley lists 710 East Main Street, Lexington, KY 40502 as the committee’s address. That address matches a co-working space run by Your SMARTOFFICE Solution. A call to that office Wednesday revealed the company has no affiliation with Club for Conservatives PAC and the committee is not a client. In addition, five of the emails (Nov. 28, 26, 21, and both from Nov. 22) have another mailing address, from another state, listed at the bottom: 435 Merchant Walk Square, Ste 300 — 516, Charlottesville, VA 22902. This appears to be in or near a strip mall, according to a Google Maps search, roughly 400 miles from Lexington. The Nov. 20 email listed the Lexington address at the bottom, while the Nov. 13 and 16 emails, and the most recent Nov. 30 and Dec. 1 ones, didn’t include a mailing address. There is a common email address in the “from” field of the emails: info@supportroymoore.com. The SupportRoyMoore.com domain appears to have been registered on Sept. 25 to a P.O. box in Tuscaloosa, Alabama, using GoDaddy.com and a phone number with an Alabama area code (information that has been removed or hidden in the last couple of days). That phone number belongs to Bob Blain of Pelham (outside of Birmingham) who said in a phone interview that he did not register the domain, hasn’t heard of Club for Conservatives, and does not know anything about the P.O. box. 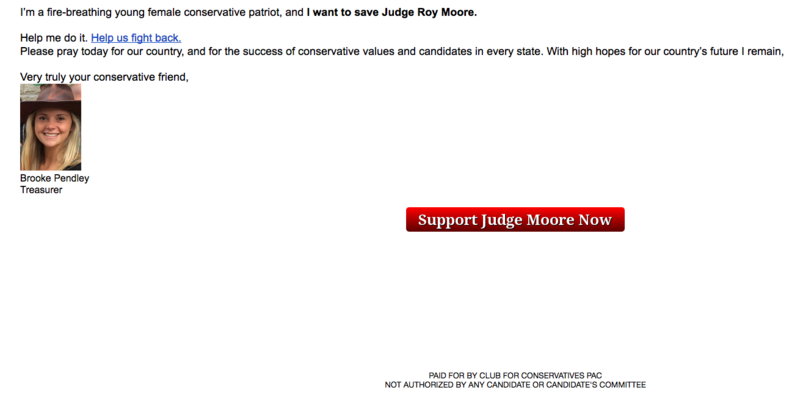 The website is very basic and consists of one page with a couple of photos of Moore and a place to enter a name and email address to “Sign the Pledge to Stand with Roy Moore!” There is no disclaimer, disclosure, contact information, or place to donate money, or even a mention of Club for Conservatives PAC. But the info@supportroymoore.com email address was used in fundraising emails from Solution Fund PAC on Nov. 14 and 25 and Sept. 26. Solution Fund PAC was registered with the FEC on Aug. 27 by Robert San Luis, a trailer-park developer, according to The Daily Beast, and run by John Mathis out of Baton Rouge, Louisiana. The committee raised nearly $500,000 through the end of September, had $100,000 in loans from Mathis, and finished the third quarter of the year with $183,000 in cash on hand. Solution Fund PAC is also soliciting financial support to indirectly help Kelli Ward of Arizona, Danny Tarkanian of Nevada, Chris McDaniel of Mississippi and Tennessee Rep. Marsha Blackburn, according to the PAC’s one-page website. But Solution Fund’s fundraising emails have also gone out from different email addresses including teamroymoore@solutionfund.com, info@kaydaly.com and kay@kaydaly.com. Kay Daly is a conservative activist and consultant who most recently received 2.8 percent of the vote in last year’s Republican primary in North Carolina’s 13th District, finishing eleventh out of 17 candidates. A call to Mathis on Wednesday was not returned. Basic searches don’t reveal a Brooke Pendley who matches the profile and picture of the woman from the Club for Conservatives fundraising emails. Five emailed interview requests over the course of five days sent to Pendley via ClubForConservatives@gmail.com (the email address listed on the FEC statement of organization) and two to info@supportroymoore.com have gone unreturned. There is an Alexa Brooke Pendley registered to vote in Forsyth County, according to the North Carolina State Board of Elections & Ethics Enforcement website. That Pendley registered to vote as a Republican on Oct. 26, 2015 and voted in the 2016 primary, runoff, and general elections. She is also registered to vote from the same Clemmons, North Carolina address as Nathanael and Betty Pendley. Calls to Nate Pendley on Wednesday and Thursday were not returned. To add more mystery to the situation, the Alexa Brooke Pendley in North Carolina goes by “Lexie,” according to local sources. And the picture from eight of the fundraising emails looks like one of the Pendleys’ other daughters, Katherine or “Katie.” The Thursday and Friday emails didn’t contain a photo in the signature. Attempts to reach Lexie and Katie via Twitter on Thursday were unsuccessful. “Phantom” or “scam” PACs aren’t new. These committees aren’t directly affiliated with the candidate and can’t legally coordinate with the candidate. They raise money on the prospect that the donor is helping the candidate, but a majority of those funds often goes to consultants. The people behind the PACs aren’t often hidden and instead are visible in the media in order to raise their profiles and raise more money. The FEC has tried to crack down on these PACs in recent years (in part because of their proliferation) and encouraged Congress to take legislative action, particularly on disclosure and disclaimers. In this case, the FEC can’t and won’t likely act until or unless a formal complaint is filed. The commissioners would then decide whether to investigate through an inquiry. The FEC could decide to conduct a for-cause audit, but since Club for Conservatives PAC is less than two months old, it hasn’t had to file a quarterly report yet and there hasn’t been time to miss a deadline or raise copious amounts of money that might increase awareness and suspicion. The penalty for not having a legitimate treasurer is unclear, considering current and former FEC sources can’t remember a comparative case from the past. But the bottom line is that the treasurer is the one who is authorized to raise and spend money for the PAC, and if that person isn’t legitimate, then the group is fraudulently raising money and subject to penalties.